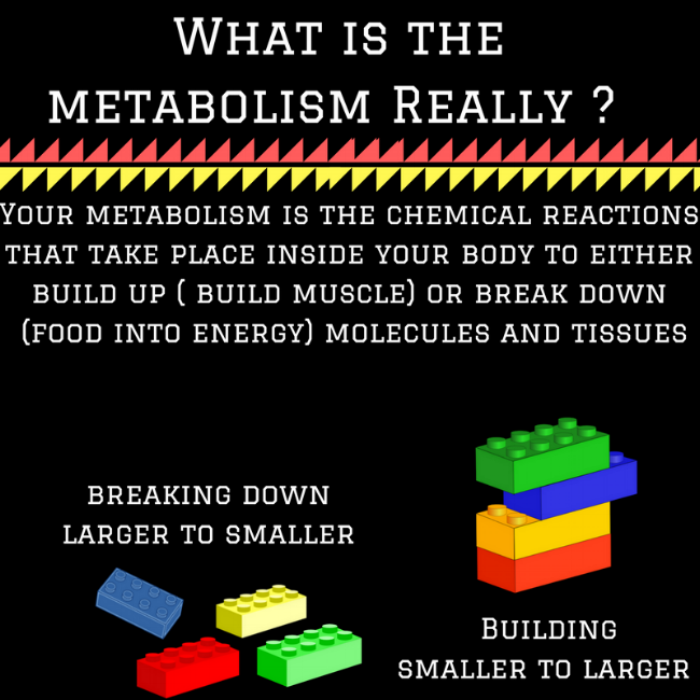 What Is The Metabolism Really ? Your metabolism is the chemical reactions that take place inside your body to either build up ( build muscle) or break down (food into energy) molecules and tissues. 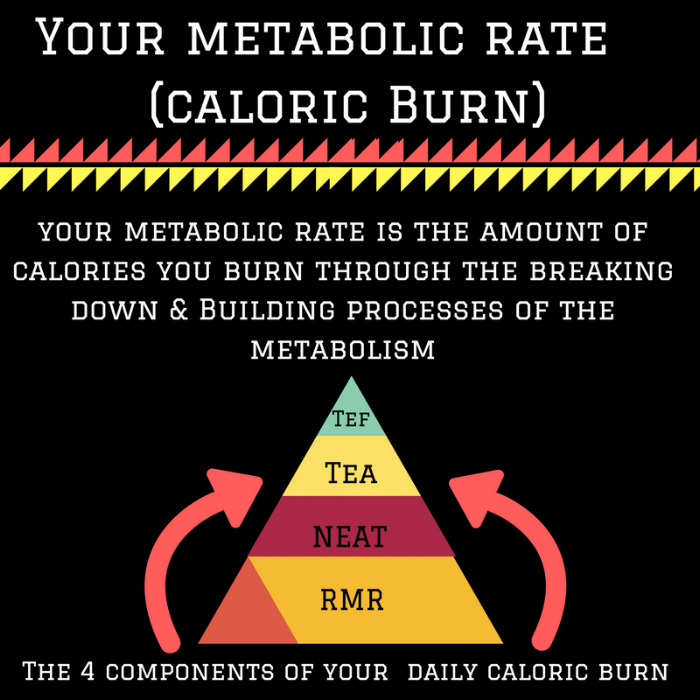 The 4 components of your daily caloric burn: The four components of your metabolism that will control how many calories you burn on a daily basis and includes. 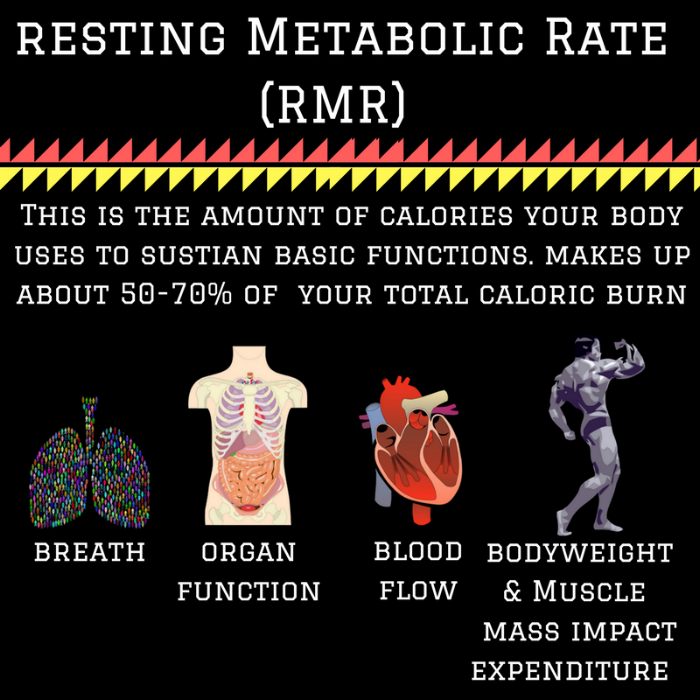 Resting Metabolic Rate (RMR): This is the amount of calories your body uses to sustain basic functions. Makes up about 50-70% of your total caloric burn. This includes the amount of calories the body burns to support your breathing, organ function, keeping blood pumping and is impacted by your bodyweight and muscle mass. 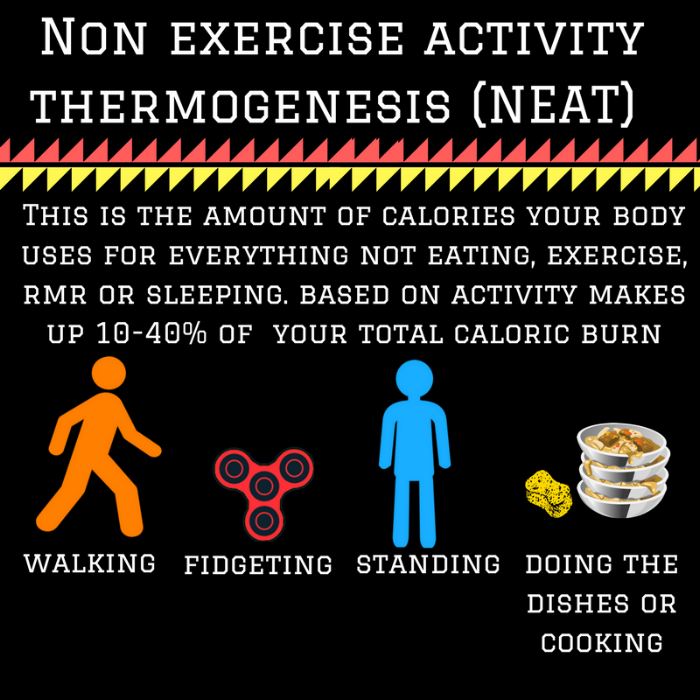 Non Exercise Activity Thermogenesis (NEAT): This is the amount of calories your body uses for everything not eating, exercise, RMR or sleeping. 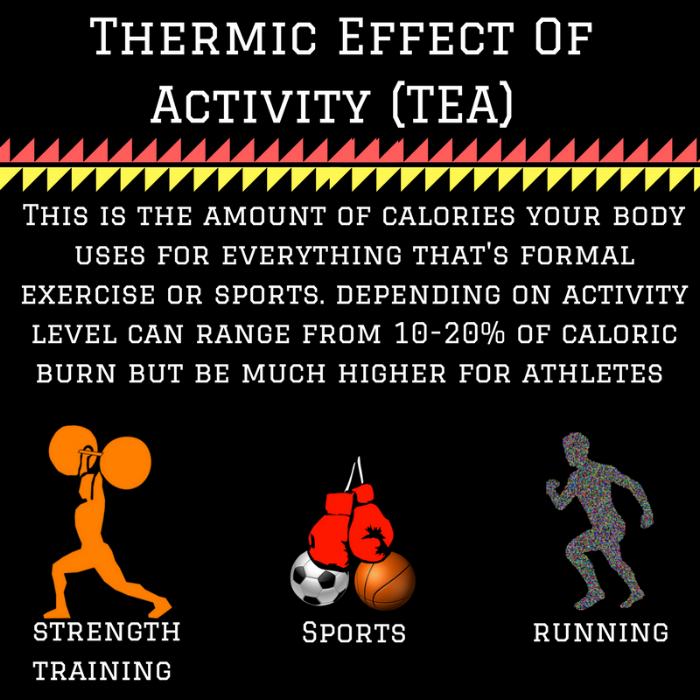 Based on activity makes up 10-40% of your total caloric burn depending on your activity level. This includes but isn’t limited to walking, fidgeting, working at a standing desk, cooking or doing the dishes and any other kind of movement that isn’t for the purpose of elevating your heart rate or engaging in formal exercise. TEA is going to include all forms of strength training or exercise, any kind of sports like soccer, basketball or boxing or any kind of running. 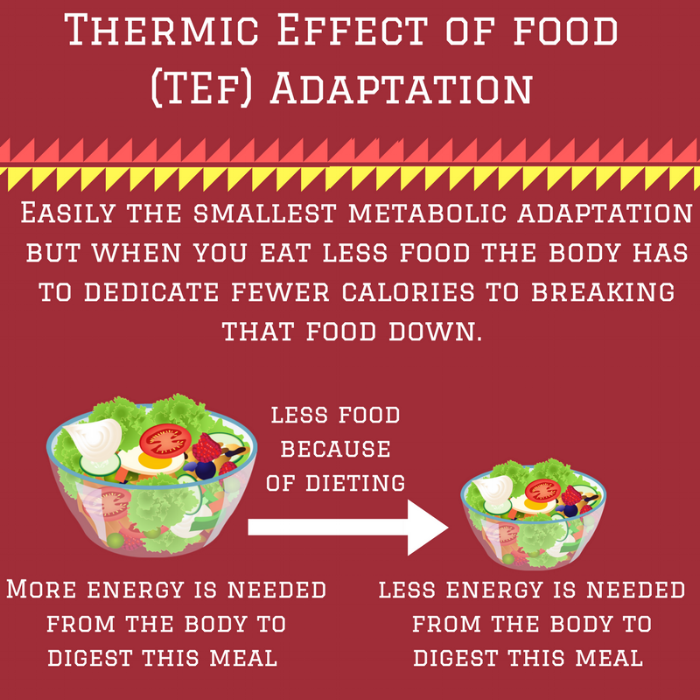 Thermic Effect Of Food (TEF):This is the amount of calories it takes to digest the food that you eat. When you eat the body has to use expend energy to breaking down food into the usable molecules in the body. Each macronutrient has a different level of TEF calorie burn, and makes up about 10-12% of your caloric burn. Can Your Metabolism & Metabolic Rate Change ? As you lose weight and diet, each different part of the metabolism has an adaptive component to it that will cause it to change as a response to weight loss and dieting. We'll be covering how RMR, NEAT, TEA and TEF all change as you diet to lose body fat in the in the rest of this series. There is a lot of talk about specific diets that help someone accomplish fat loss and while the food choices among these diets are very different there is one principle they all have in common with regards to fat loss… they help create a calorie deficit. What Causes Any and Every Diet To Work For Fat Loss ? To achieve fat loss you’ll need to be in a calorie deficit, meaning you’re burning more calories than you’re eating. When this is done on a consistent enough basis assuming there are no special considerations the result is fat loss. You can create a calorie deficit by eating fewer calories, or by increasing exercise. The reality is that most people burn far fewer calories during exercise than they think. I hate to be the bearer of bad news, but chances are extremely good you burn far fewer calories exercising that you assume. For that reasons when it comes to creating a calorie deficit and effort is take into account it heavily favors eating fewer calories over trying increase exercise enough to burn way more calories. 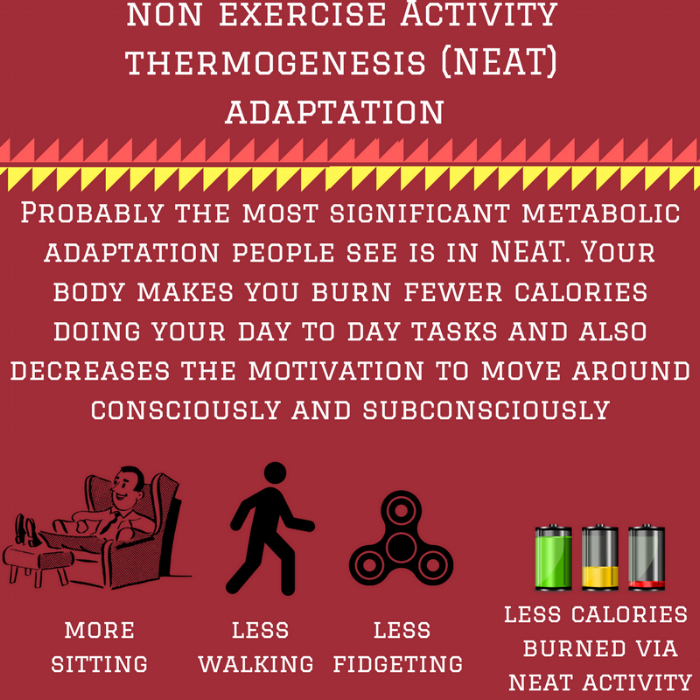 On the opposite end living in a constant state of being in a large calorie deficit will cause the body to adapt and find ways to burn fewer calories wherever possible. The truth is your body doesn’t really want you to lose body fat because one of your main evolutionary goals is to conserve calories for survival, and fat loss directly threatens that goal by burning extra calories off your body. As you lose body your body will find ways to make this fat loss more difficult to achieve and slower. 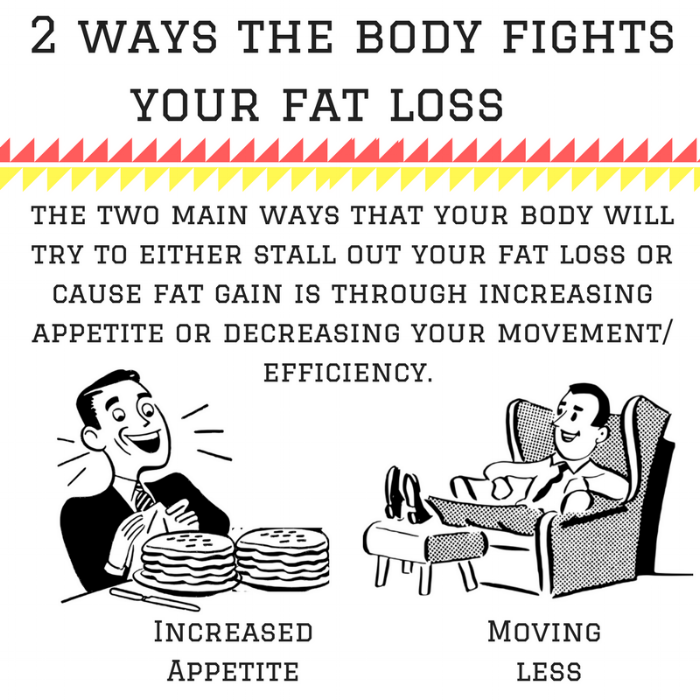 The two main ways that your body will fight back against your fat loss is to make you move less which reduces your NEAT and burns fewer calories. Secondly when you’re in a calorie deficit the body will increase your appetite and cravings in an attempt to get you to eat more food and gain back the fat that you lost. 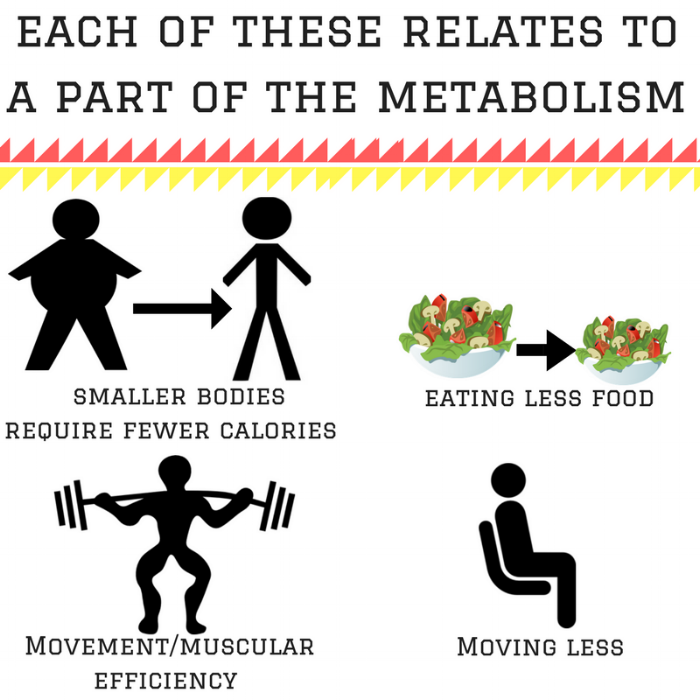 There are other metabolic adaptations that take when someone is in a calorie deficit or has lost body fat place such as a smaller body burning fewer calories. 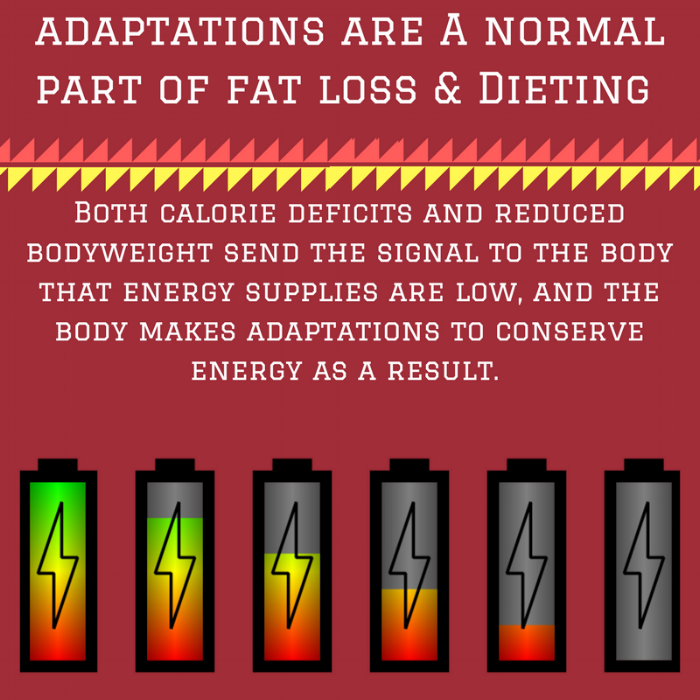 Decreased food intake resulting in a reduced thermic effect of food and movement/ muscular efficiency where the body will adapt to burn fewer calories for the same movements as done before. 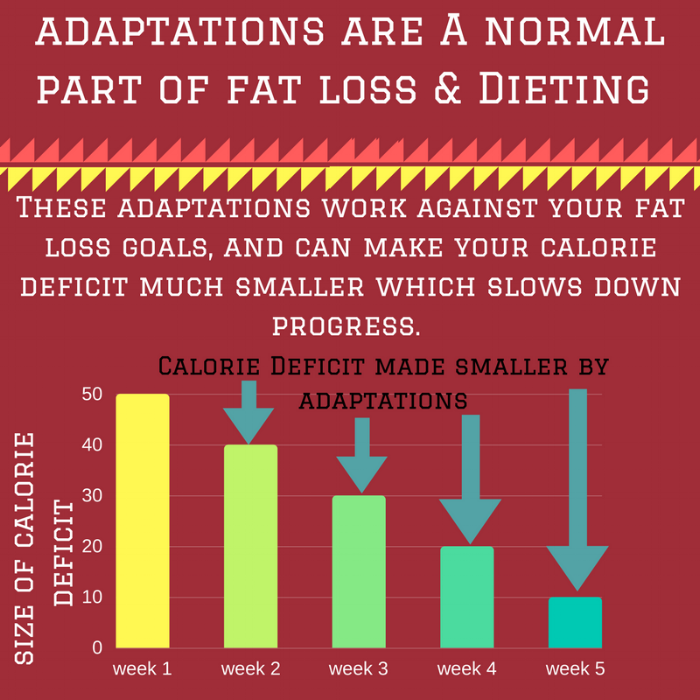 All of these different adaptations are part of the way your metabolism can modify your calorie burn with fat loss, and slow down your future fat loss. Is It Metabolic Damage or Starve Mode ? You’ve likely heard of “Starve Mode” or “Metabolic Damage” but in many regards those are inaccurate, these are expected calorie expenditure reductions that takes place when someone loses fat, or eats in a calorie deficit for too long. To what degree and how quickly your body will adapt to fat loss is highly individual, and something we’ll discuss in an upcoming posts. 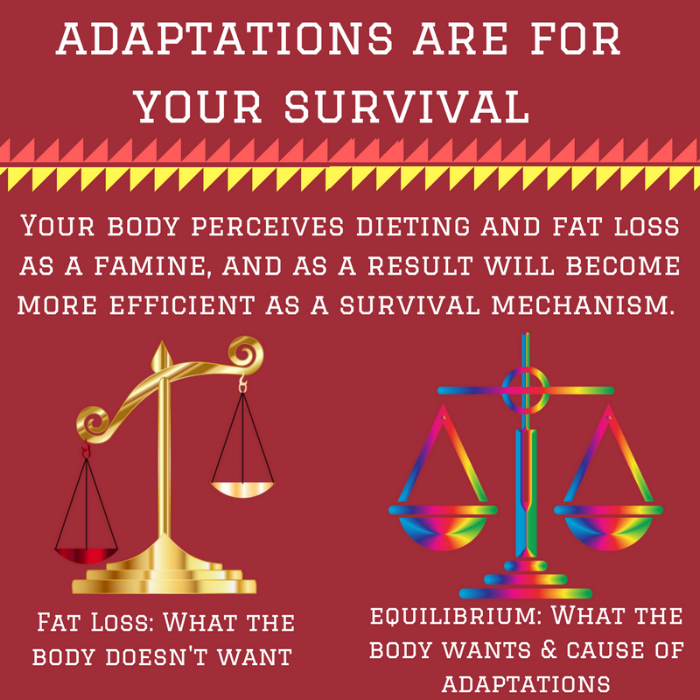 The whole reason that you’re able to lose body when you diet is due to stimulus and adaptations. When you’re in calorie deficit the fat loss you achieve is an adaptation to the stimulus of burning more calories than you’re consuming regularly. These adaptations that take place as you lose body fat and weight are a completely normal part of the process, but it doesn't necessarily mean that your body is pleased with the situation though. When you lose body fat and weigh less you'll naturally burn fewer calories because a smaller body requires less energy to manage and run. On top ofweighing less when you give the body far less energy via food it starts to send the signal to the brain that those precious body fat (energy) stores are getting low which can register as a threat to your survival. When you diet to lose body fat you are mimicking a form of controlled starvation, and your body doesn't know the difference between you looking to get lean or something that could be a threat to your survival. As your body fat gets lower your body and brain begin to recognize that the stored calories that are necessary in case of a famine are getting more and more scarce which means it needs to adapt in an attempt to bring you back into equilibrium. Most adaptations in the body are meant to bring you back into a state equilibrium and remove you from any form of stress. These adaptations are meant to help you survive which is the main goal from an evolutionary perspective along with procreation. Your body becomes much more efficient with how calories are burned and used in the body when you're dieting as a way to ensure your survivalthrough the perceived starvation you're putting it through. Your body'senergy efficiency and adaptations will start to directly oppose your fat loss goals because the body finds ways to make you burn fewer calories both at rest and during exercise in an attempt to bring you back into equilibrium and protect your fat stores. You'll even want to move less to conserve more energy both consciously and unconsciously, and your hunger signaling and appetite will also be impacted in an attempt to get you to eat more. 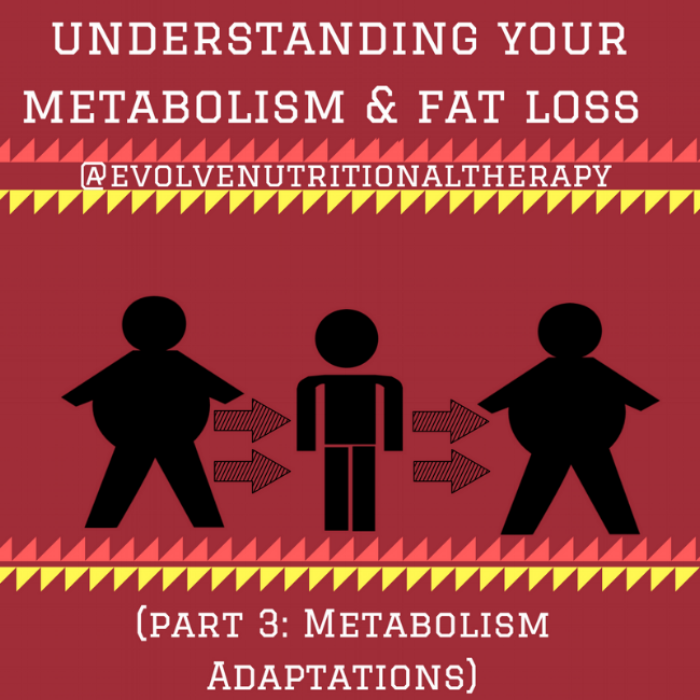 Each part of your metabolism is uniquely impact by these adaptations to fat loss and that's what we're be discussing below is the different ways each component of the metabolism is effected. As we mentioned above when you lose body fat and weigh less the body will have to expend fewer calories to manage and maintain your new lower bodyweight. Another consideration is if you've been dieting and haven't consumed adequate protein or been t strength training the body will not be getting the signal to maintain muscle mass and it can be used as an energy source. While not hugely significant muscle mass is a more energy intensive tissue to maintain, and uses up more calories than body fat and contributes to a higher resting metabolic rate. The main way to ensure that muscle mass is preserved is to use strength training as a stimulus and signal to the body that to manage the stress of lifting heavy things you'll need to hold on to as much muscle as possible. Adequate protein helps to rebuild and repair lean tissue ,and also blunts hunger very effectively. Double whammy! For a long time people have undervalued the amount of calories we expend daily through NEAT activity, and this is also where people will see the largest reduction in their caloric expenditure when dieting due to a number of factors we'll be covering below. A large part of the magic that takes place with NEAT activity is that a lot of it is unconscious things that we don't give thought to like fidgeting, deciding to stand or sit when working or the basic day to day movements that are part of your normal routine. As someone gets deeper into dieting for fat loss what they don't consider is that the body will inherently make them move less by encouraging you to sit more, park closer or drive to someplace that they used to walk to daily. While these are small considerations on a daily basis they add to a significantly lower caloric burn throughout the day, weeks and months. Another interesting part of the NEAT calorie reduction equation is that even if you do maintain the same level of NEAT activity while dieting the body makes you more efficient by reducing the amount of calories your burn during that activity. In the same way that your body ensures you burn fewer calories through NEAT when dieting it does the same for more formalized exercise and strength training as well. As you strength train for an extended period of time and the body gets somewhat used to the stimulus of strength training or cardio, and the stimulus requires fewer calories because the body and your muscles have adapted to the movements and forms of exercise you've been giving it. This reduction in caloric expenditure can be made larger when someone is dieting as the body will strive to conserve calories and become more efficient wherever it can. Another point worth mentioning is that you'll have less energy in the gym or on the field, and as performance in the gym reduces your intensity which can translate to an even bigger reduction in calories burned. This is likely going to be the smallest and least noticeable when it comes to a reduction in your metabolic rate, yet from a psychological perspective having to continually eat smaller portions and less food can be psychologically taxing for many people. None the less because you are eating fewer calories and a smaller amount of food your body is going to have to expend fewer calories to digest, breakdown and assimilate those calories. On top of that we we mentioned above when you're dieting part of the struggle is with the reduced caloric burn, but there is also the mental battle. You body will actively decrease satiety hormones in the body and upregulate hunger hormones in an attempt to get you to eat more food. In essence the body will make you hungrier and far less satisfied on the same amount of food. Want this blog post and the graphics in a PDF you can read anytime ? Fill out the form below and hit submit to download this blog and all the graphics as a PDF to read and reference at any time!